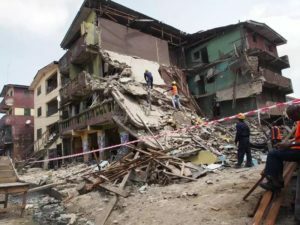 Home » Why do buildings collapse? Buildings collapse for many reasons but generally people can tell the cause based on the shape of the structure once it has settled. A prime reason for collapse of a building is loss of stability. This occurs when a specific force or combination of forces impact the shape and integrity of the building. The building cannot support the force and will change the shape and integrity of itself to find a more stable shape. However, buildings usually collapse for more than one reason. A building that catches on fire is exposed to temperatures that are so high that they cause expansion of some of the building’s elements. This causes weakened floors and roofs, it can also cause walls to be forced out of shape. By adding massive amounts of water onto the structure, to put out the fire, more stress is added to upper floors which causes a failure. Natural, geological events could cause the collapse of a structure as well. The movement of the earth caused by earthquakes or landslides can be either horizontal or vertical and can cause the amount of stress on the structure to exceed the amount that it can withstand. The ground on which the structure is built may also become waterlogged causing the structure to lose its integrity and collapse. This situation is called liquefaction and is the leading cause of collapse along a coastline. If a structure is in an area that experiences high wind speeds, then it is susceptible to collapse. The wind itself is not cause enough for the structure to collapse, however, the wind could blow off the roof creating a suction on the side away from the wind and substantial pressure inside of the structure which would cause a collapse. Flooding and a vast amount of rain could cause a structure to fill with water, which would displace air and cause the pressure inside of the structure to change. Snow build up could also cause the collapse of a structure, especially if the roof is flat. Sometimes, due to poor workmanship, design, and materials a structure can collapse. One such example is when contractors do not let the concrete slab set sufficiently before removing the stabilizing struts. This causes the slab to go through its support and fall to the floor below, often creating a chain reaction of multiple floors collapsing. This force is always man-made but can be classified as accidental or intentional. With explosions there is always the chance for a secondary collapse. Buildings next to the explosion may also collapse due to the new load they take on upon the explosion of the other building. Accidental collapse can be caused by leaking gas that ignites and causes too much pressure inside the structure. If air is rapidly admitted into a compromised building it could cause a backdraft which would then cause a collapse. Also, the detonation of volatile products stored within a structure, or a dust explosion could cause total failure. In recent times, most intentional collapses have been caused by acts of terrorism. Examples would be 911 or the Oklahoma City Bombing. When an explosive is detonated within a structure, a shockwave of air is created that displace windows, doors, flooring, and roofs which can lead to additional damage to the structure. Exterior detonated explosions will have shockwaves that are magnified and will penetrate the structure through natural openings. The walls and roof will be under tremendous pressure and the shockwave could launch debris that could hit the structure and cause collapse. Transportation such as trains, road vehicles, and air craft could, and sometimes do, collide with structures resulting in a partial or total collapse. The size and purpose of the vehicle will affect the severity of the collapse. This section will explain the types of collapse and if there are voids created. A void is an area underneath or within the debris that clear and where there is a chance of finding the most survivors. Void formation varies from collapse type. This collapse occurs when the load bearing walls fail causing the floors above to fall on the floors below. This collapse is catastrophic and generally very few voids remain after the structure has settled. The voids in this collapse would be cause and shaped by appliances, furniture, and machinery that interrupts the stacking effect. This is the most complex collapse and requires extensive searching for survivors and a lengthy period of debris removal. This collapse occurs when a supporting wall, beam, or column at one end of the floor fails causing the floor to tilt down creating a triangular shaped void. The large void formed by this type of collapse increases the chance of any survivors. This collapse is formed when the collapsed end rests on top of debris, furniture, machinery, or the next floor. This means both ends of the floor are supported. This collapse is created the same way as the supported lean-to collapse, however, the failed end hangs over the floor below. There is no support in this case and the failed end is only held together by reinforcements and other binding elements in the flooring. This is a hazardous situation and the unsupported collapse must be stabilized before search and rescue procedures can take place. This collapse is caused when the middle of the upper floor gives way due to a heavy load causing two triangular voids on either side of the collapse. This means that survivors can be found in a larger area. Victims from the top floor would be forced in the direction of the collapse and land in, and possibly be trapped in, debris. Which would require a range of tools to cut and break into the debris. This collapse is the opposite of the V collapse. The failure occurs at the exterior walls while still having support from one or more interior load bearing or non-load bearing walls. The A-Frame collapse can be caused by explosions, earthquakes, liquefaction, excavation of adjoining areas, or water damage. The area to search for survivors is in near the partition wall closest to the center of the collapse. Towards the exterior walls there is less of a chance of finding survivors. This collapse occurs when a wall falls away from the structure at a distance that is equal to its height. This causes a spread of debris as it hits the ground. Structural fires can result in this type of collapse. Voids will only form in the collapse zone. This collapse occurs when a wall collapses straight down to the ground and creates a pile of debris at its base. There will most likely be no voids created from this type of collapse. This type of collapse occurs when a horizontal crack forms in the wall, around the center line. The two halves will fall in different directions with the top half falling in to the structure and the bottom half falling out. Total collapse is the most severe form of collapse. This type of collapse occurs when all the walls have collapsed onto the floor leading to all the floors collapsing to the ground level or basement. Basement collapse is rare. This collapse occurs when the ground floor collapses into the basement leaving all the upper floors intact. However, if the ground floor is a shop front then the upper floors may tilt forward leaving them unstable. Searching for survivors in the basement is very difficult. During search and rescue the stability of the whole structure must be monitored. If you have a property that has experienced any of the above types of collapse it may be time to call AAA Public Adjusters. You can reach us 24/7 at 800-410-5054.